There are those who would try to tell you that a) you can't fish two rods effectively, and b) that the second rod will always be cast into the less likely spot and as such using two rods doesn't catch more fish than using one rod. A prime example, two actually, of why this is cobblers happened last night. For one of the few times this season I was fishing a swim that enabled me to put two rods out. To start with the downstream rod fished a bait under a raft of rubbish on the near bank and the second rod went upstream and across to fish in front of an overhanging bush. After dark the far bank chuck, which was tricky in daylight, became impossible so that bait was dropped in closer, on the crease formed by a near-bank willow just upstream of me. I'd have put money on the downstream rod producing, not least because I had put some feed in that spot while the upstream bait had just the one bag of mixed pellets. I'd have lost the bet because at quarter to nine the 10mm pellet on the upstream rod was taken. A good scrap ensued and a nice fish was netted. Before the bite came I'd been thinking to myself that it was quite amazing that I'd never caught a double on a pellet, and now I was pretty sure I had one lying in the net as I readied the sling, mat and scales. I gave it an hour longer in the swim, one I'd had my eye on for a while but not previously fished before moving to the banker swim. Once there I put a boilie in the usually productive spot and the pellet went upstream in the main flow beyond a bush where I had never had a sniff before. After just half an hour the pellet was away, but this time everything went solid and I eventually pulled in a load of weed to find the pellet had twisted round on the hair and masked the hook point. Two chances, both to the 'second string' rod and bait. So much for one rod being all you need. 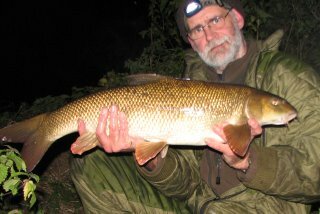 The evening was warm, and turning misty - which I have never found to be a good thing when barbel fishing. So, at eleven thirty I packed up wondering if the pellet had scored because of it's size, the smaller hook being used or pure chance. I'm leaning towards the latter, but that won't stop me trying the 10mm pellets again next time!